Canned salmon can be an excellent and easy substitute for the whatever protein you typically put in your favorite taco recipes. This delicious dairy free option is ideal for people who do not tolerate dairy, but if you can't live without the 'real thing' its easy to replace the cashew cream with sour cream. In a skillet heat up just enough oil to coat the bottom and fry the tortillas until warmed through and golden brown on the outside. 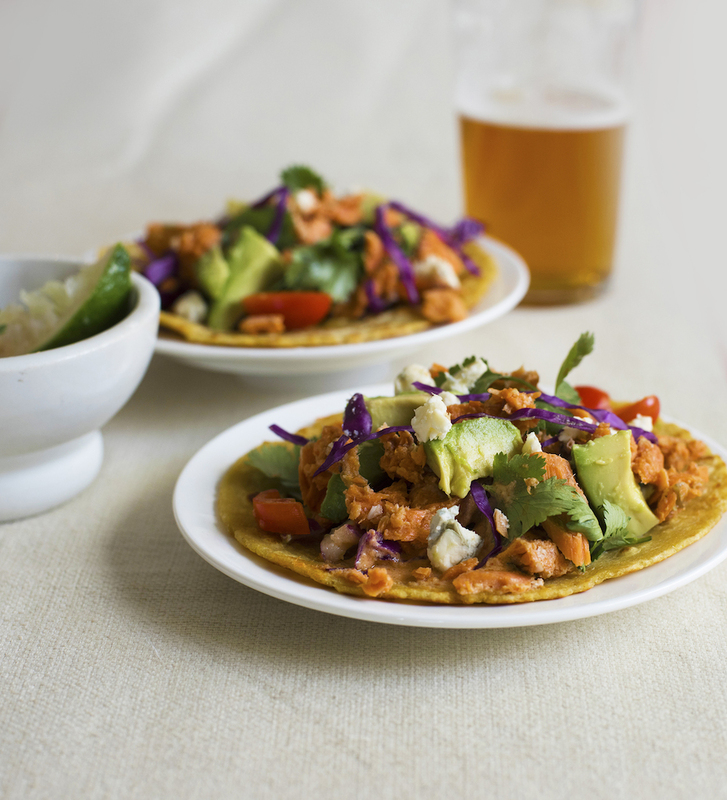 Remove from pan and in each tortilla divide up chunks of salmon topped with Crema and Cabbage. Finish with a few Cilantro sprigs. In a food processor or blender add all ingredients together and puree until combined. Keep in a container with a tight fitting lid or in a convenient plastic squeeze bottle. Pour enough hot water over cashews to cover by 1 inch and soak for at least 8 hours or overnight. Drain cashews and blend with ½ cup cold water and salt to taste in a high powered blender (if you have a Vitamix or other professional blender that’s great, but my Nutribullet works just fine) and blend until completely smooth and creamy, store in fridge for up to a week.